Just got back from a training run. Being Friday, and actually having to work most of this week (ie four days) I thought I should take things pretty easy, so set off up the Bridal Veil track, and continued up to the Temple Basin Car park, then headed up the Dobson Nature walk, continuing over the morain wall into the Otira Valley, then headed down the road to return to Arthur's Pass in 1h,8m. Looking at the map that's 10.3K but not a huge vertical gain, although the track undulates a bit. It would be a good trip when things are snowbound higher. 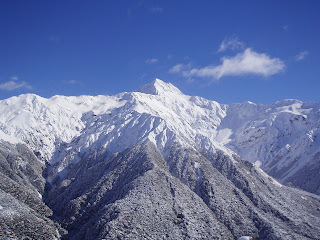 The picture is of the bealy Valley, with the Otira Valley on the right. Thats Mt Rolleston.